My gallery focuses on my Toy Collection which I have been collecting for many years. 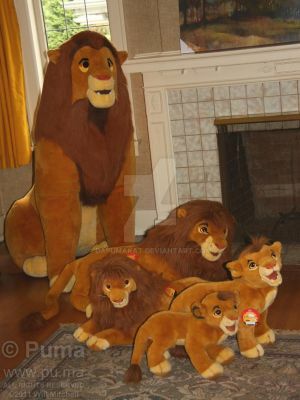 Most of my toy collection is based on my love for big cats and the Disney movie The Lion King. I collect both new and older toys, mostly focusing on stuffed animals, but I also collect other toys and miscellaneous figures. Many of the toys and stuffed animals in my collection are from other parts of the world, as I travel extensively and speak multiple languages. I really enjoy sharing my collection with other people as well as seeing other's collections as well. After all what good is a collection if you cannot share it with others. I always enjoy hearing from others. If you have a thought, something to say or a question. Please do not hesitate to contact me or comment. If you like my gallery, please add me to your watch list as I add new stuff frequently. Current Residence: Point Roberts, WA U.S.A.
That is amazing, you and Simba all over the world, so cool! hey there - greetings from a fellow TLK collector from WA! it's great to see another passionate collector here in my beautiful home state. unfortunately I am a still-unemployed 20 yr old college student and most of my collection consists of childhood toys and things I've been able to find @ thrift stores over the past 11-12 years, but looking forward to the day when I'll have enough $$ to 'make it to the big leagues' so to speak and start actively seeking out rarer merch. can't thank you enough for sharing so many great photos of these amazing and rare pieces. excellent collection. keep it up and take care!